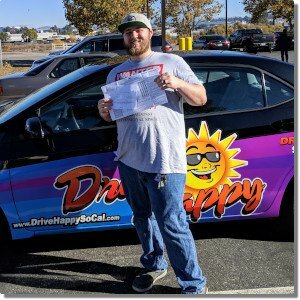 Home / Behind-the-Wheel / Why Private & Personal Driving Lessons? Why Private & Personal Driving Lessons? At Drive Happy Driving School we strongly believe that private & personal driving lessons are essential to the training process. Our reasons are based on 20 + years of teaching experience with real world student drivers. What’s a Private Driving Lesson? Private driving lessons mean that there is one student in the car at a time. This is a key component of the Drive Happy teaching philosophy because it created and environment where the Drive Happy instructor can focus 100% of their attention the student driving the vehicle, and not dividing attention between the student driver and the stranger riding in the back. Private driving lessons allow the Drive Happy instructor to create a safe learning environment where the student driver feels comfortable enough to learn from mistakes. If your student driver is in a car with another student in the back seat this is absolutely not possible. Private driving lessons mean the Drive Happy instructor has time between lessons with no student. This is essential for the Drive Happy instructor to decompress and mentally reset between student drivers. This also allows the driving instructor to use break time for personal business that is not subtracted from student driver teaching time. What’s a Personal Driving Lesson? A personal driving lessons means that each student remains with their own driving instructor for all of their driving lessons. Student, instructor, and parent become a team working together to achieve the common goal of safe driving. 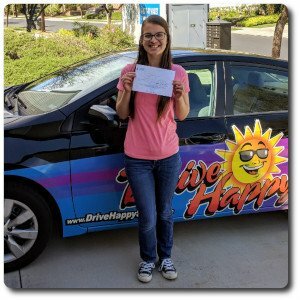 A personal driving lesson allow the Drive Happy instructor to customize the lesson plan to each indivual student because they are with the same student from the beginning to the end of the training process. A Drive Happy instructor knows the strengths of each of their individual students. 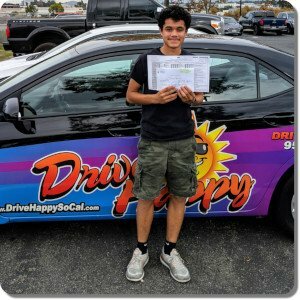 Next post: Jonathan Passes The Drive Test At The Hemet DMV!